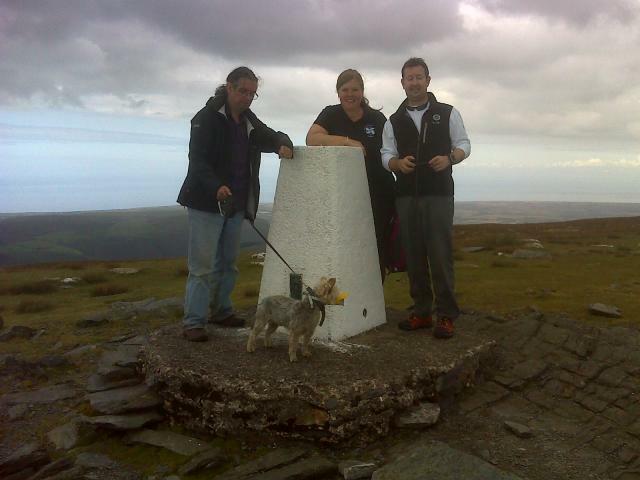 There are 96 photos for this trigpoint (view album). 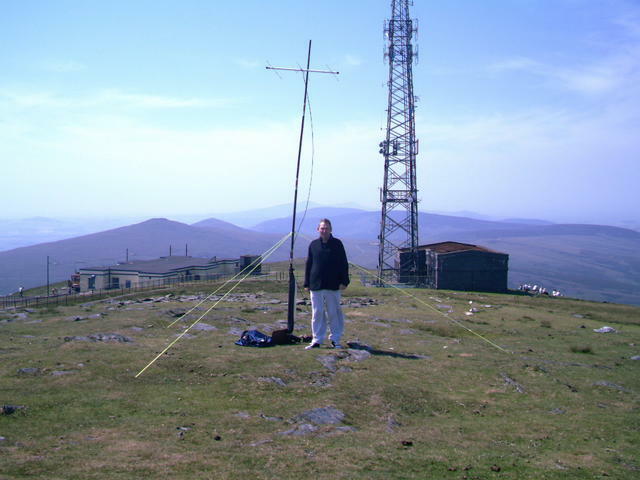 Is ranked joint 494th with 10 other trigs (more). See 88 more in the album. 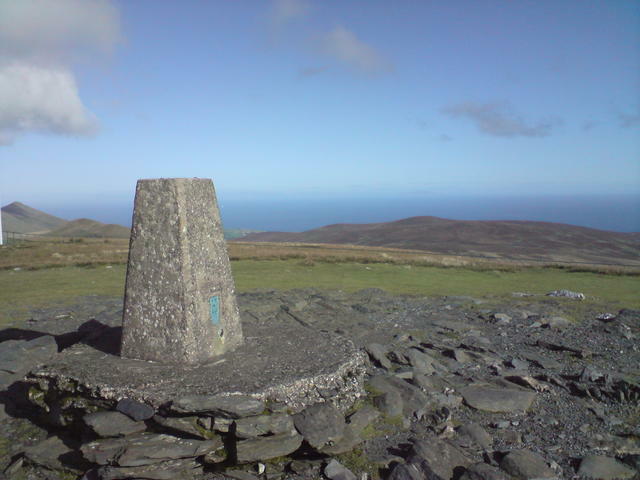 Got the mountain train up from Laxey, was extremely windy up there, so came straight back down after bagging the trig. Couldn't all 7 kingdoms due to low cloud. 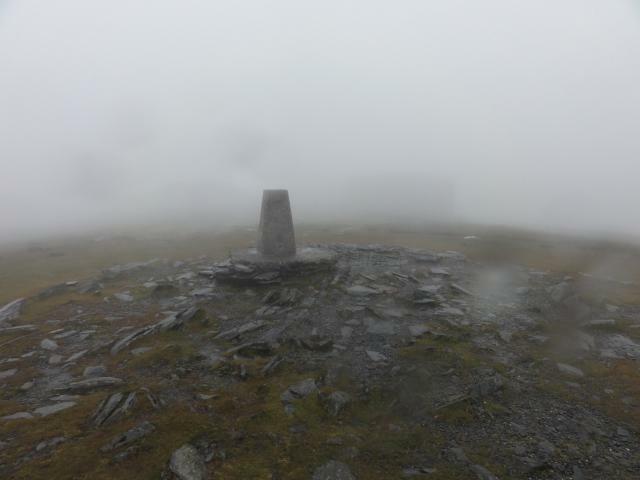 Visibility very poor today with low cloud covering the area. Parked at the Bungalow Station, up good footpath. 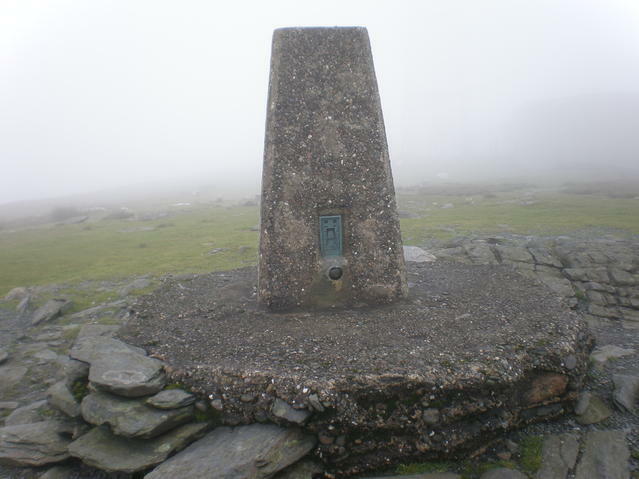 Surprisingly quiet, may have been due to low cloud and drizzle. Not much of a view unfortunately. Wonder weather and sighted all points. Ireland mountains. Scotland, England and Wales. 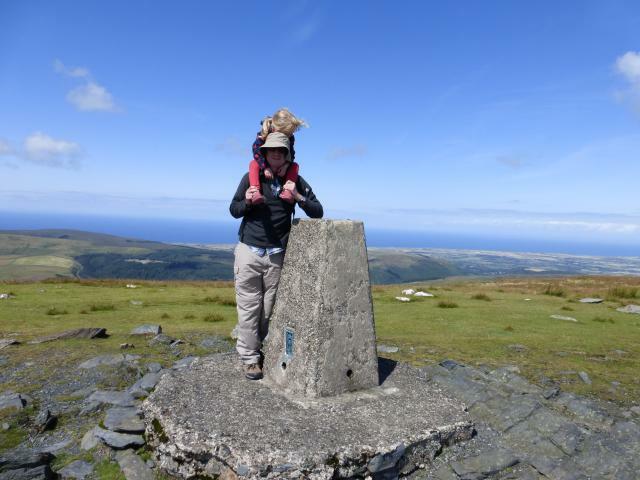 Cheated and took the train up from Laxey - much warmer than it was when we were last here in 2014, but lots of wasps on pillar so didn't hang about! Circular walk from The Bungalow, lovely day so we enjoyed the good views. 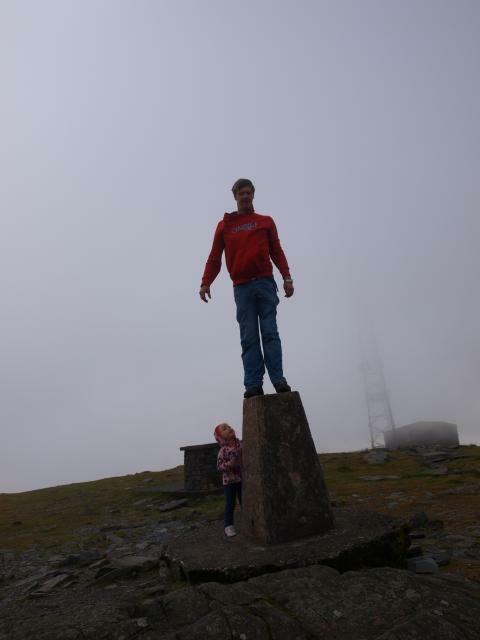 Came up the mountain railway & a bit misty at the top, so not able to see all the Kingdoms!! 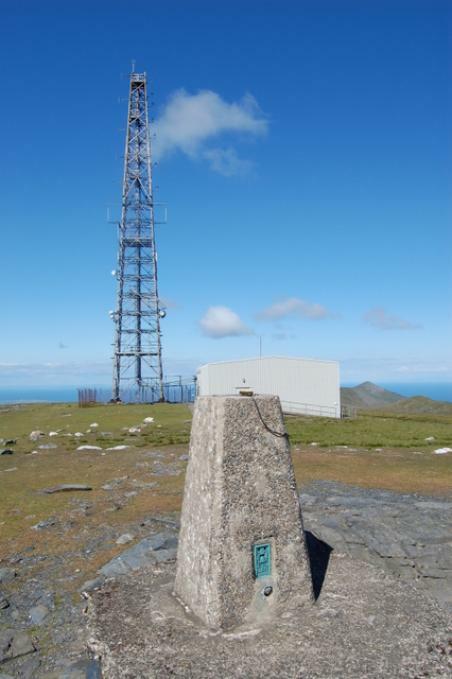 This and a couple of other trigs brought me to the IoM for a wee break. I'm afraid I caught the tram up but only because of a planned yomp to Ramsey. 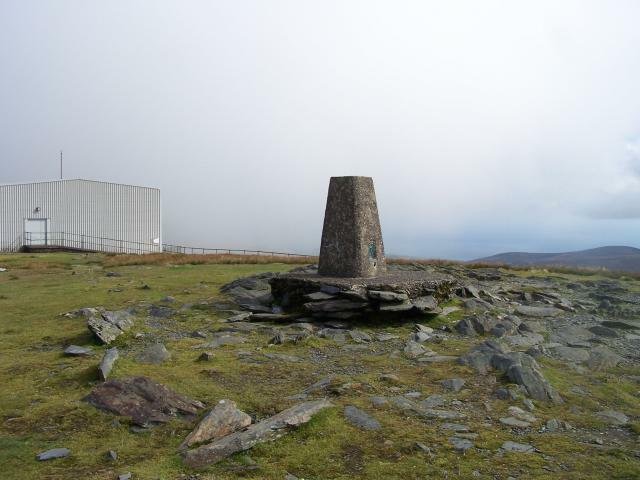 Sadly the cloudbase was too low so no views (hence score). 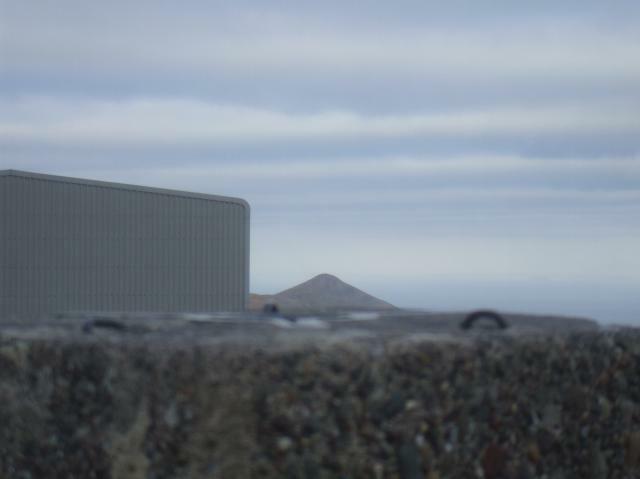 I waited 15 mins in the caf� as it looked like it might clear, but no luck, so headed off for North Barrule. 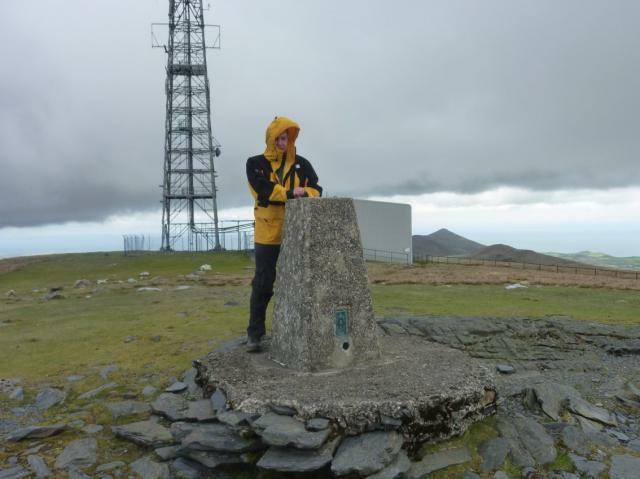 Wind speed and temperature almost made me don waterproof! 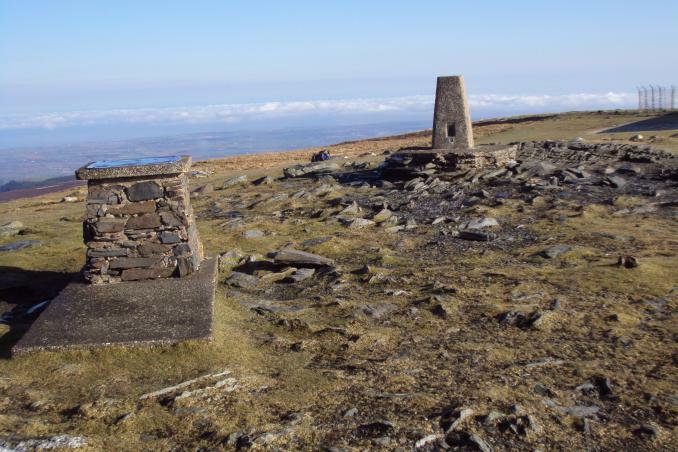 An excellent walk to this TP and wonderful views. 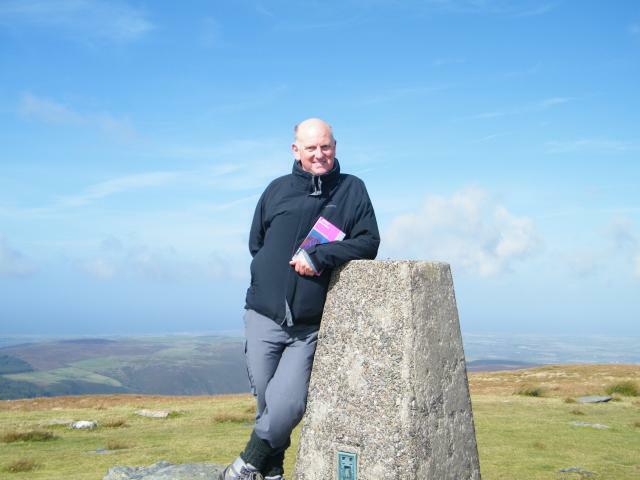 fine summit and seventh of the day in a progression getting higher each time. 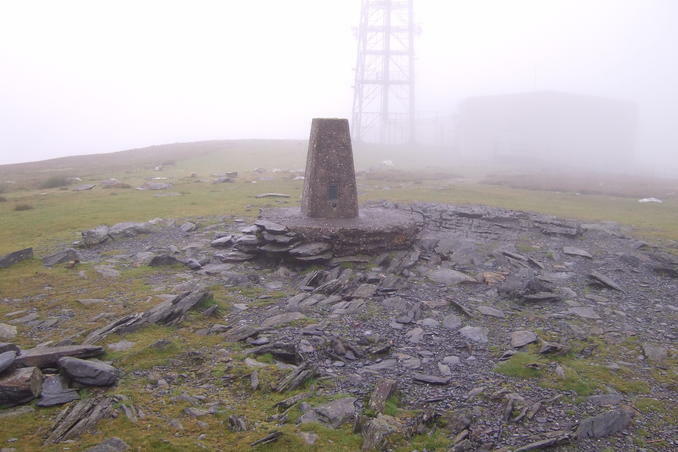 Lovely trig above the clouds. Came here to do the Heritage PowerTrail with TheHarleyRebels. 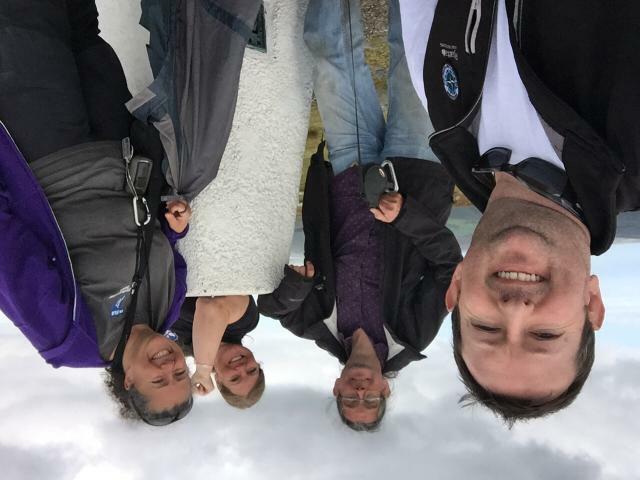 We had a great time, and was sad to come back to the mainland. 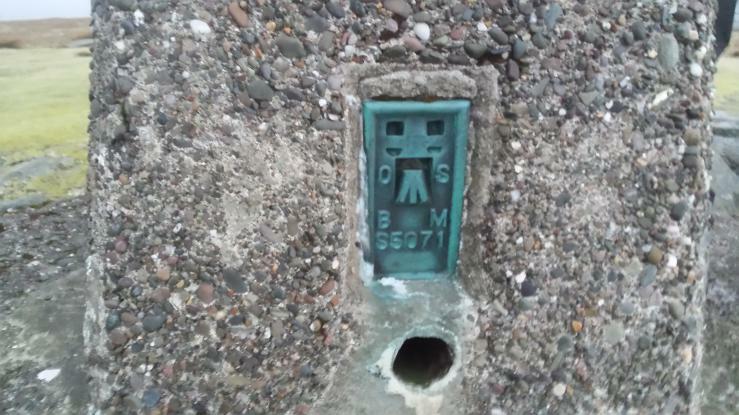 Also found the nearby 2004 cache. Elevation: 2036ft! 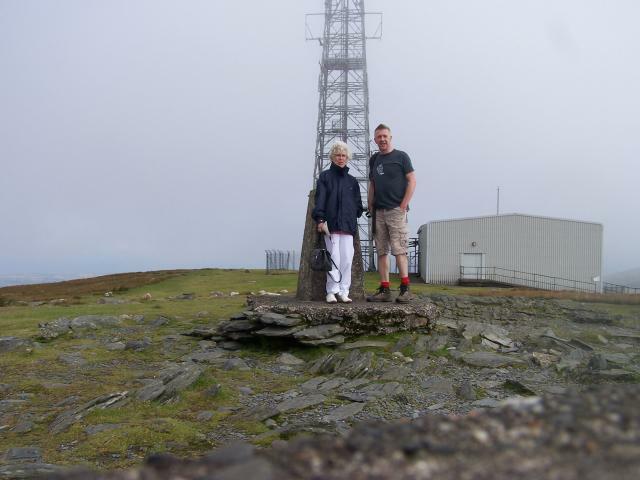 Flew to the IoM with friends for the excellent ManxCacheFest week of events, one of which was a picnic up here on Snaefell! 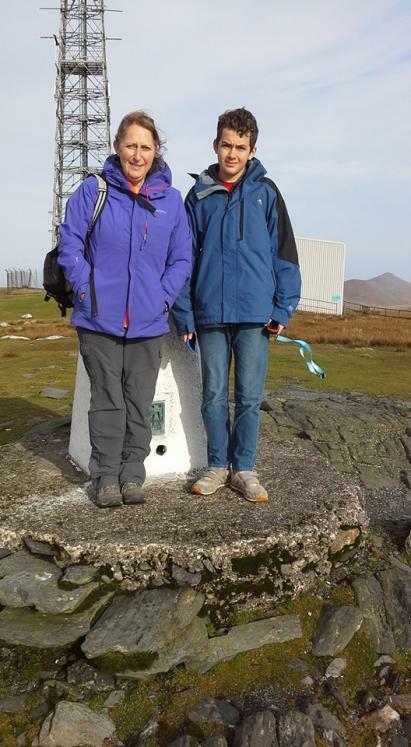 We were blessed with a wonderful day although it was a bit breezy of course up here, but the views from the trig point were wonderful = reservoir, moorland, glacial valley below and even the Snaefell Railway and cafe - what else could anyone ask for?!! 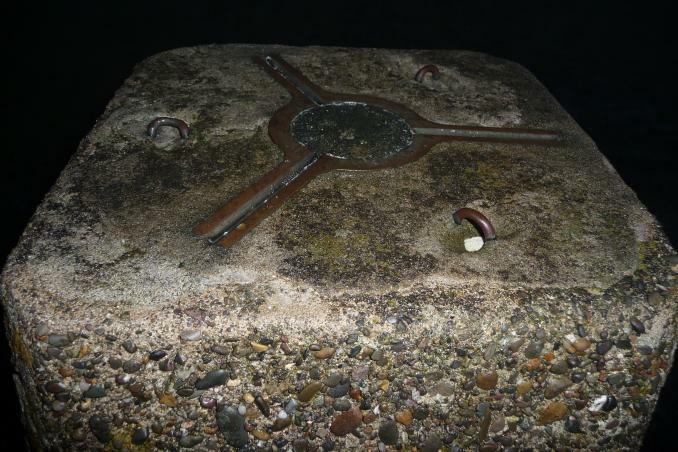 Trig point in good condition. Over for the Manx cachefest and visited this via the train. 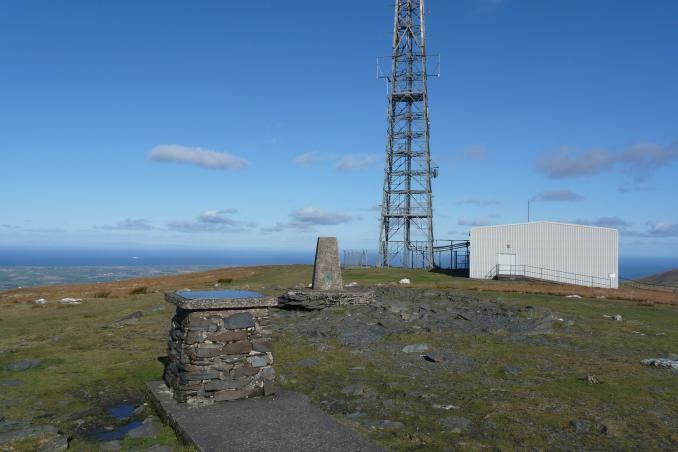 Plenty of caches up here and a trig and a cafe with great food. Good views and saw a hare. Walked all of the way up here holding onto my parents' fingers after a nice train ride up the hill. 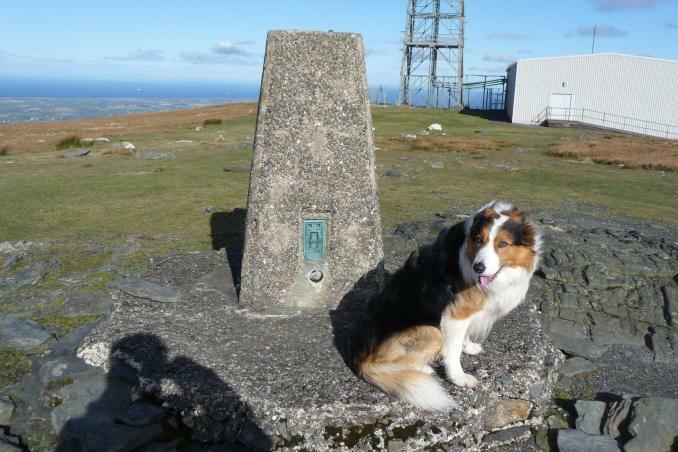 11 months old and still enjoying my trigs :-) Not much of a view today but good stretch of my leggies. Not actively trigpointing at this time, hence late logging of it. 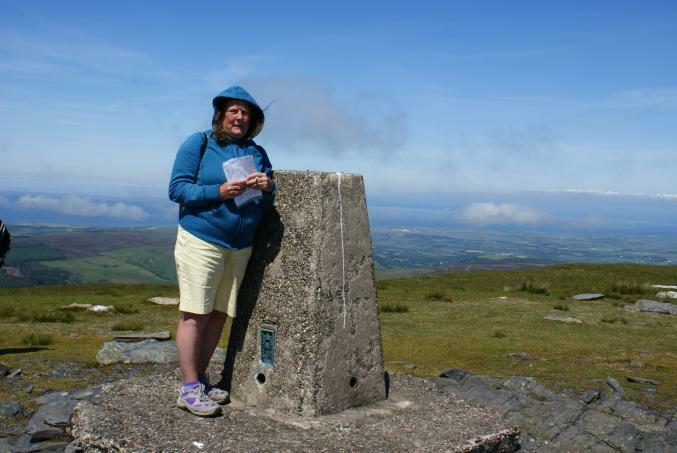 My main interest was the Snaefell Mountain Railway, and that's what brought us to the summit! Outstanding views on a glorious afternoon (heavy showers previously meant perfect visibility). windy but clear day great views! Took the tram to save my back carrying my daughter. 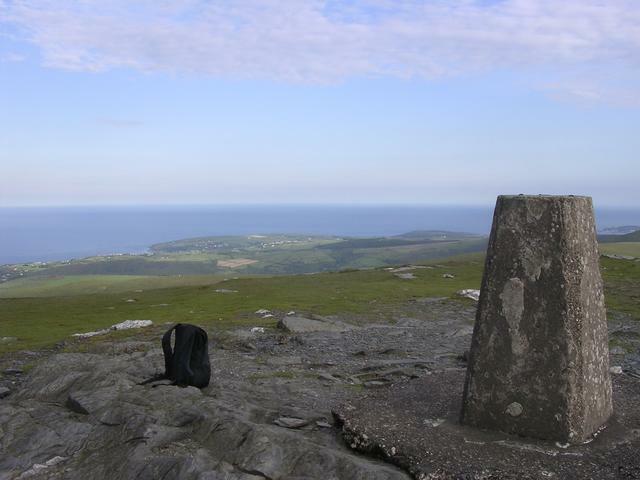 Fine viewpoint with Ireland, Scotland, England and Wales all visible! 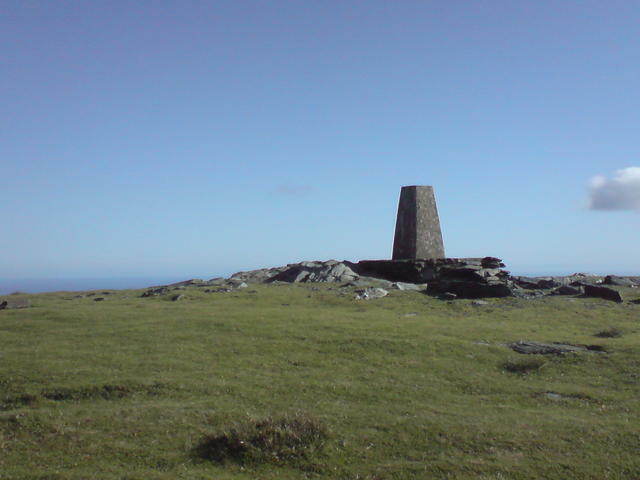 Walked up from the bungalow, good views all the way to the top - difficulty standing upright once at the trigpoint due to the high winds. Nice walk from the 'Bunglow' at the bottom of the hill. Don't be fooled though, it gets steep at the top. 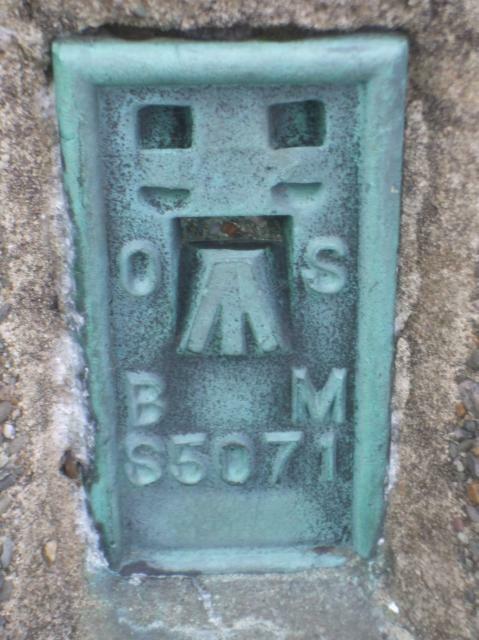 Took the train to the summit to grab the geocache and the trig was a bonus. 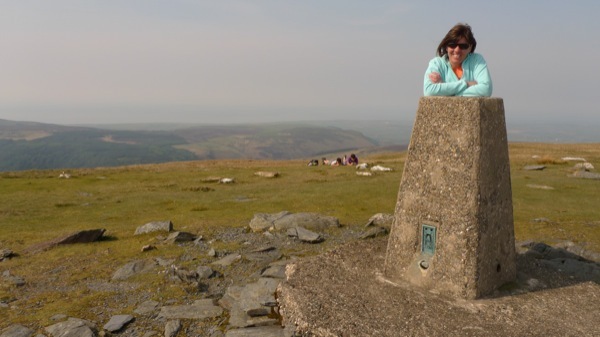 Superb viewpoint on a good day. 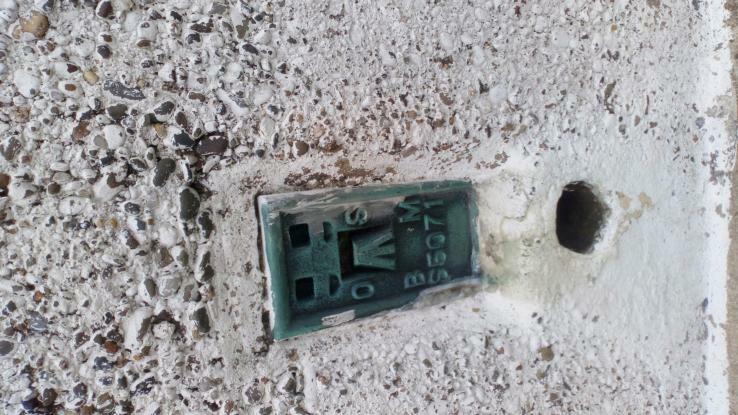 Spider centre has asphalt plug. 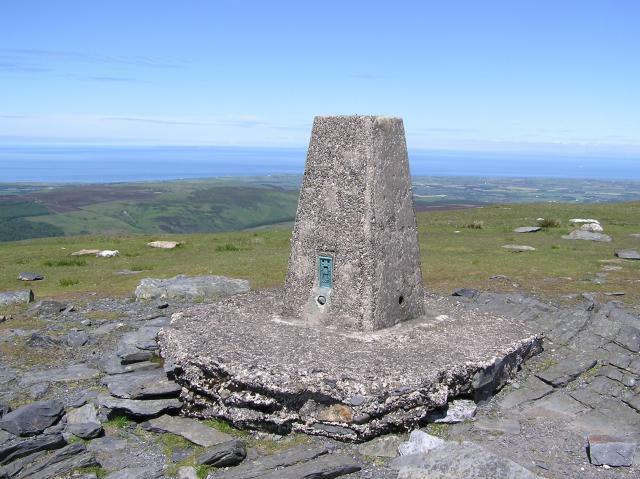 Previously visited this island HP 03/04/99 Manx Mountain Marathon. I'm sure in nice weather its lovely but today 28th June its far from summer! Rain sheeting in sideways with a gale force wind, no visibility. Got off the train and battled around the concrete path but was forced back, couldn't see. Went to the cafe for a dry off and coffee and booted up the TUK app and attempted it again following the GPS. Totally drenched within 5 mins! Still wasn't going to miss my only pillar opportunity whilst here. Went up on the train on a nice sunny morning. 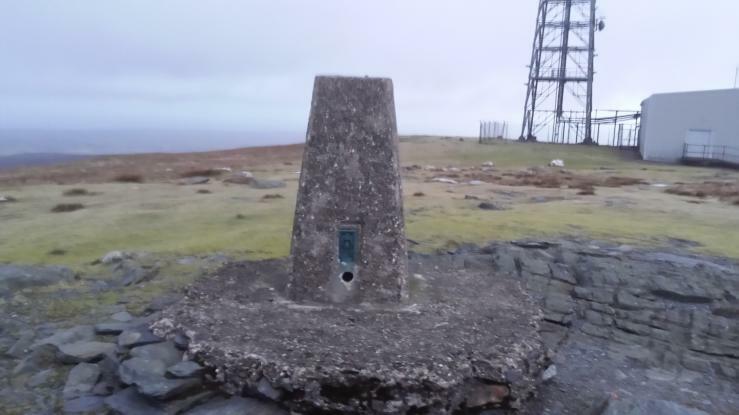 By the time the summit was reached it was blowing a gale and freezing cold. The van in the cafe said the windchill temp was -12. In May?? 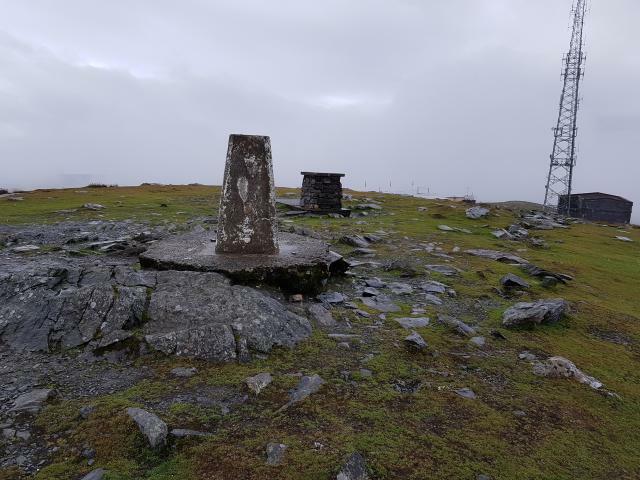 Spectacular trig with amazing views. Struggled up last bit of slope. CAme down on tram. Thanks, Ollie! 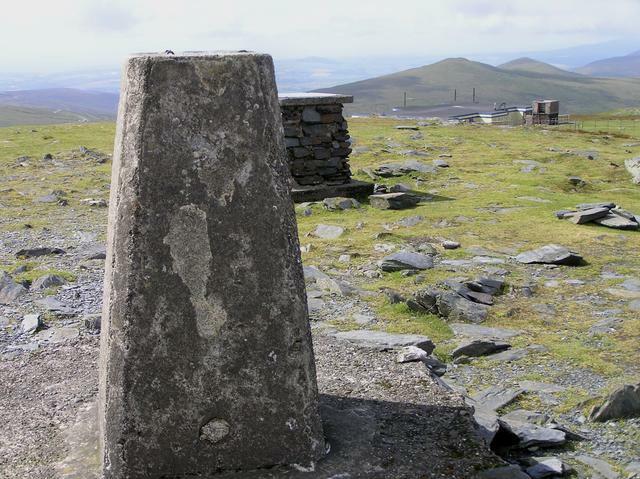 It's hit and miss whether you get a good day or bad day on Snaefell. 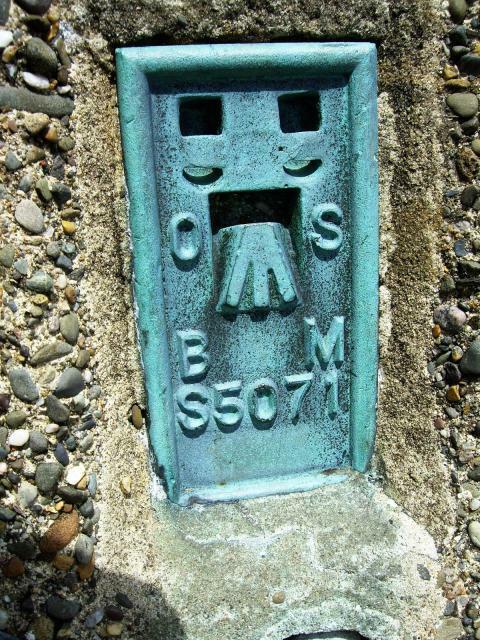 Pillar in good condition! 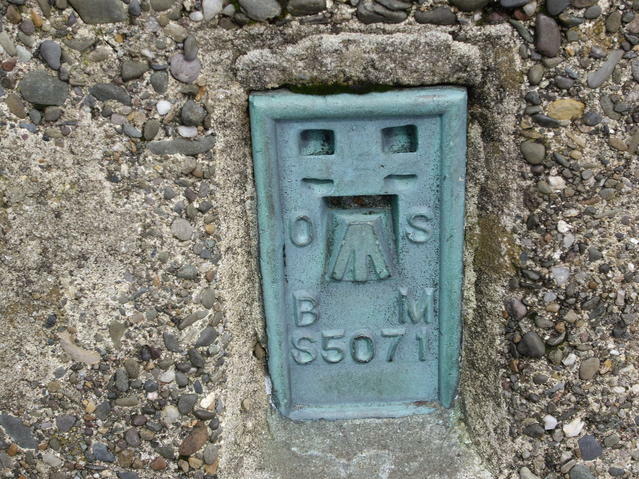 Me, the handy map pillar adjacent is great for placing your camera on! 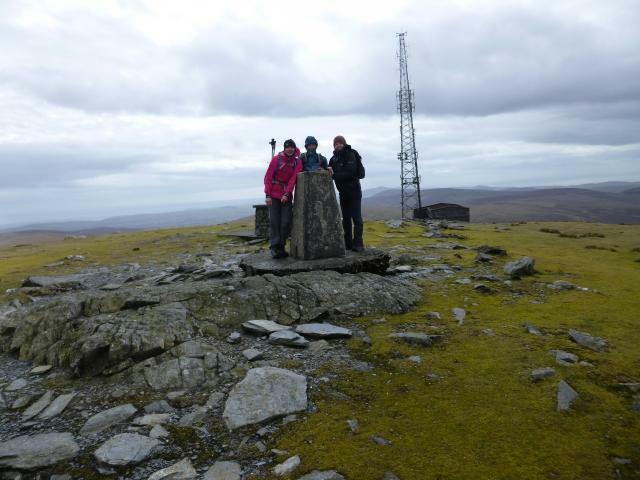 North Barrule peaking above the pillar! Beautiful, clear day. 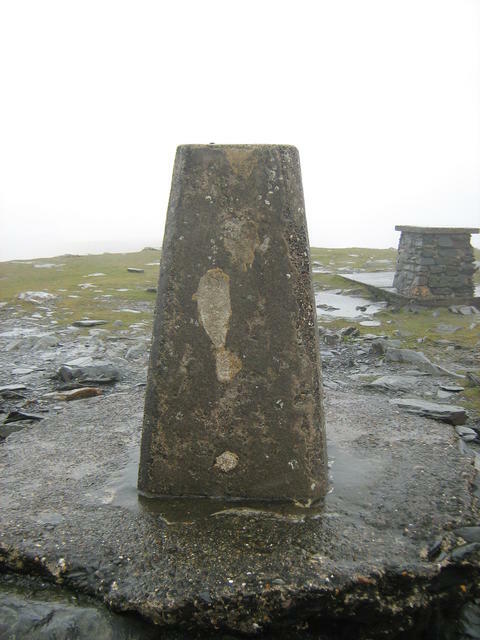 Conquered after North Barrule. 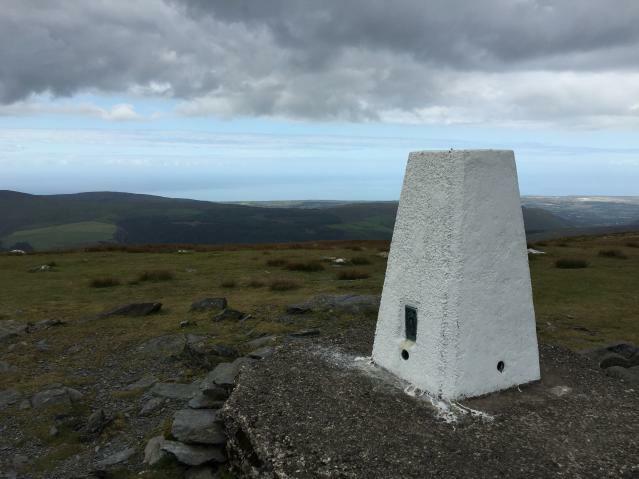 It's been over a year since my last historic county top but got here in the end,from laxey on the mines path,cross the road and up from black hut,fine views in all directions. Parked at railway through small gate, steady walk up .This morning fog on top. 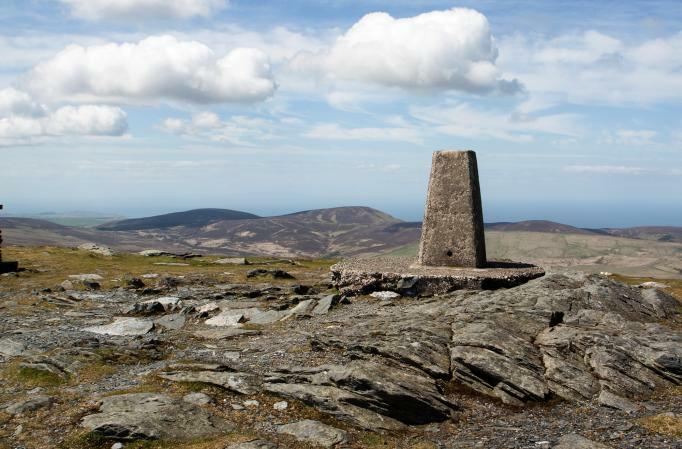 Came up here on a day trip to the Isle of Man. Lucky to have a clear day. 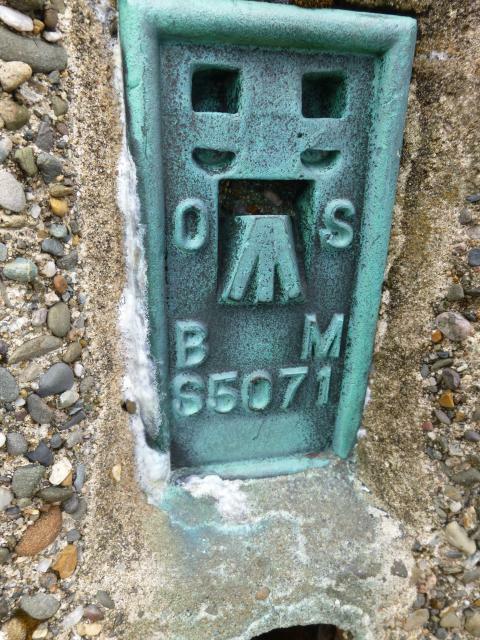 vgc, asphalt plug. Fine view, albeit a little hazy. From S, played race-the-train - it beat me by a minute or so :-( The passengers however all headed for the big grey shed so I had the trig to myself. Elevation 631 metres. 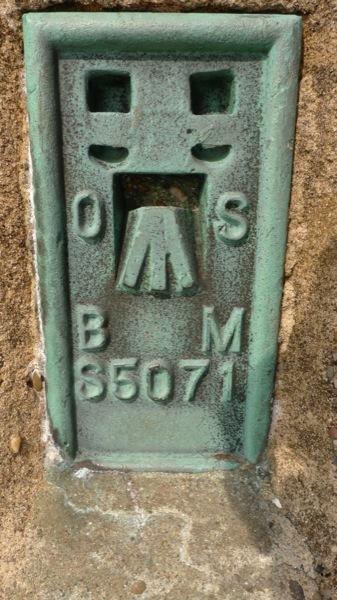 OSBM. 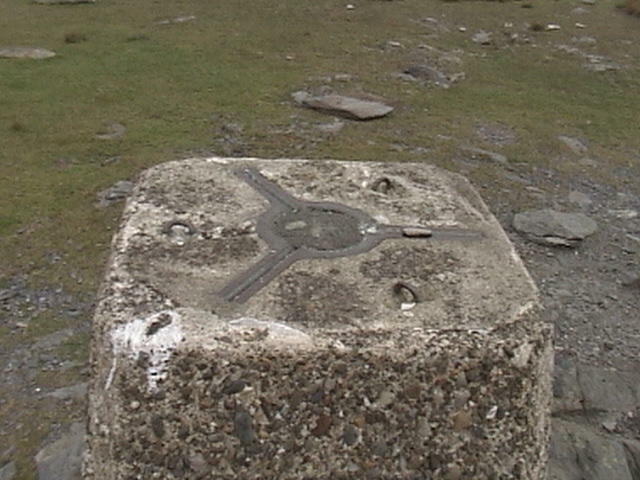 Trig point in good condition. 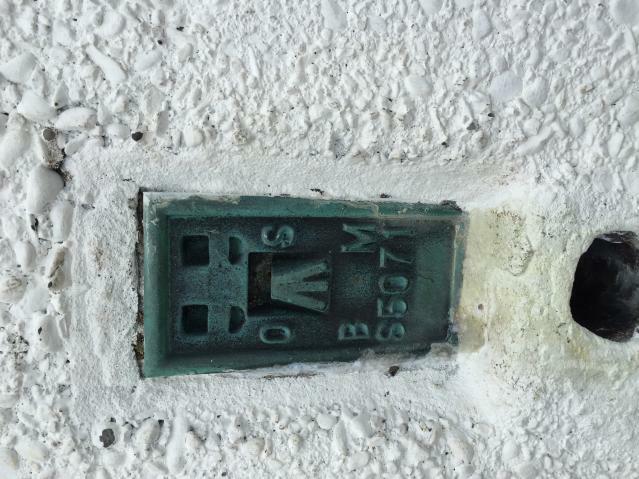 Cement plug in top threaded mount. Very exposed up here. Perpetually windy. Six kingdoms can be seen from here on a fine day. Some hares and sheep roaming about. 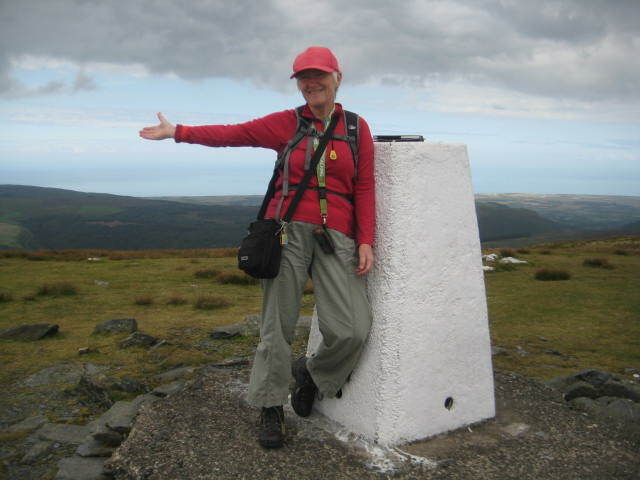 Walked up from Laxey via Agneash and Laxey Glen. 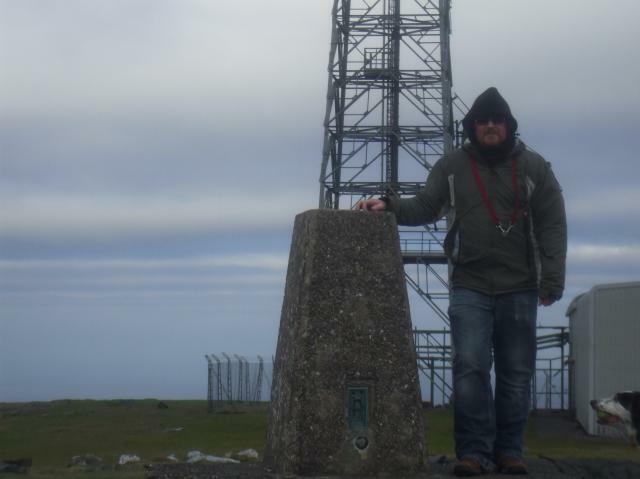 Been to the summit several times before but this was the coldest and no one else around. 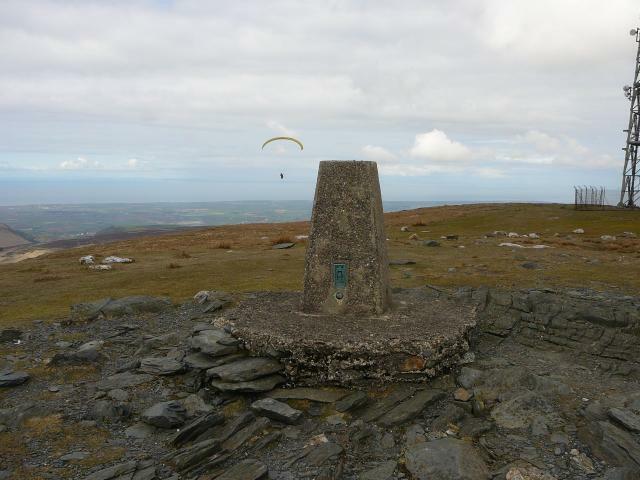 Returned to Laxey via Mullagh Ouyr, Windy Corner and Glen Roy. 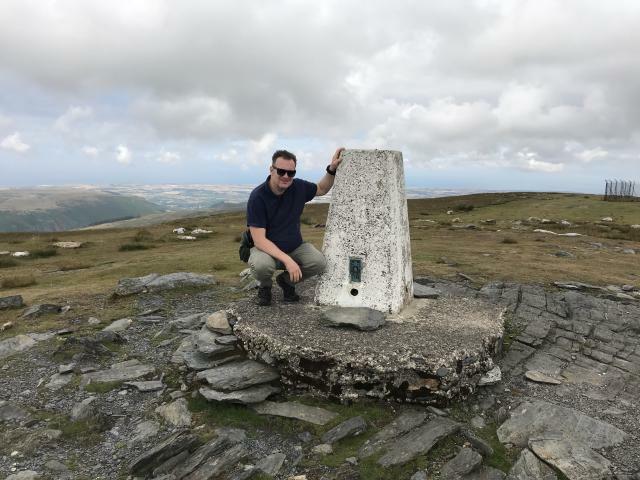 Latest visit 12/09/2017 on walk up from Laxey. Family holiday. 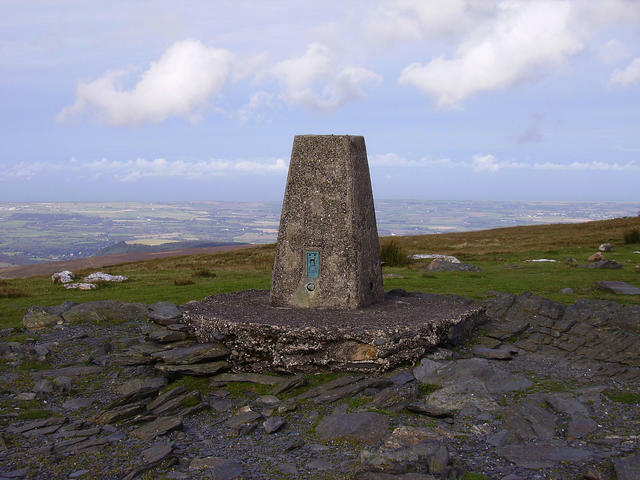 Easy and quick walk up from layby/car park. Saw the 7 kingdoms! 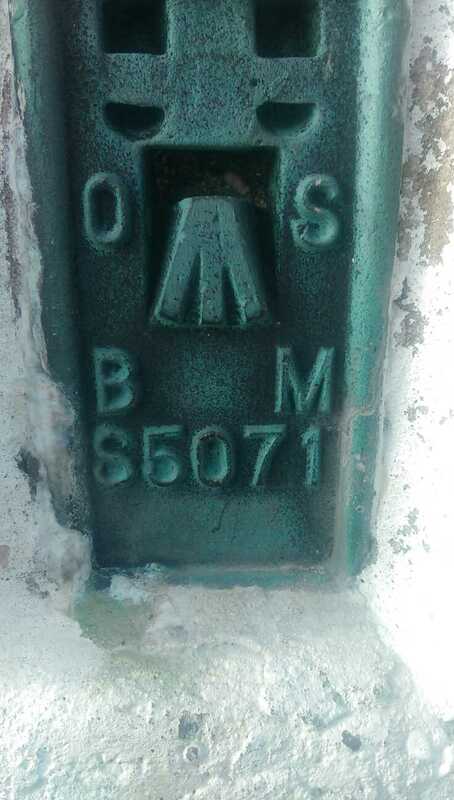 My second entry for this mountain - Ive visited the trig several times before via the Mountain Railway but always felt it was a bit of a plastic. 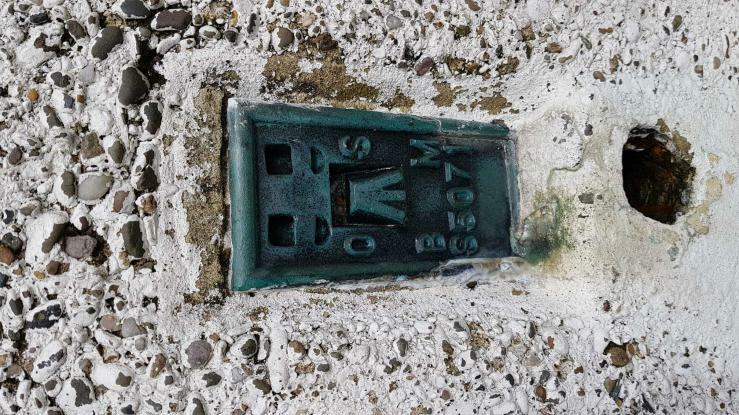 Today I got the Electric Railway to Laxey, legged it to the shore - where the tide was fully out - dipped my toe in the sea and footed it up to the summit. 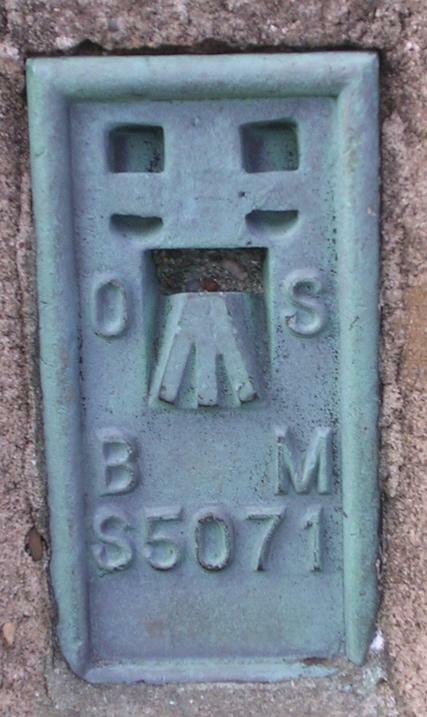 The route to the old mines is simple enough if not the best underfoot. From the mines to Bungalow is an obvious track that has been used by off road moto bikes at some point. Today it was extremely wet (day before was persistant heavy rain) and very boggy in places. 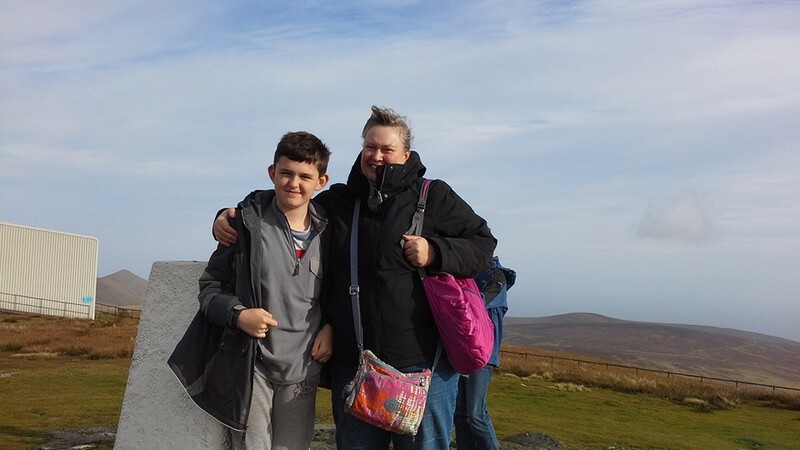 Windy as hell at the trig (in all but 1 of our visits its been just so). Generally, any photo you take wont do justice to the view the eye can see. NC(or railway)OF! Another clear day for our visit (via tram). Will walk here one day. 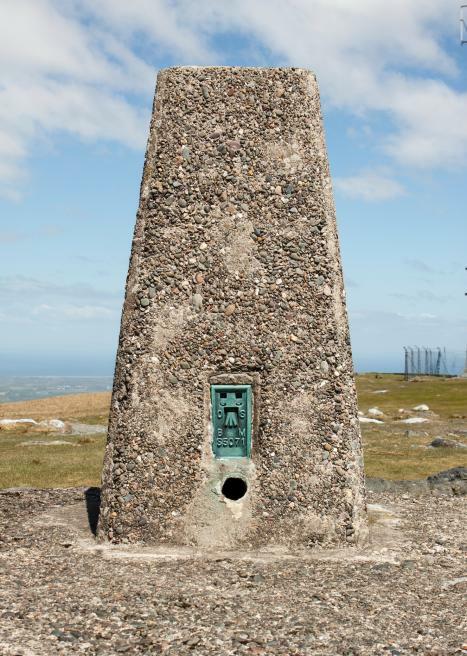 Visited here on my last day walking the Raad ny Foillan (Way of the Gull). 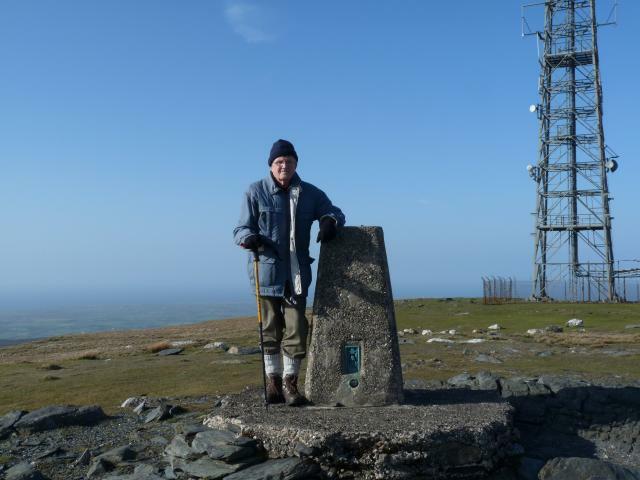 I came up Laxey Glen, across the main road and through knee deep snow drifts to the summit, carrying full camping gear the whole way. 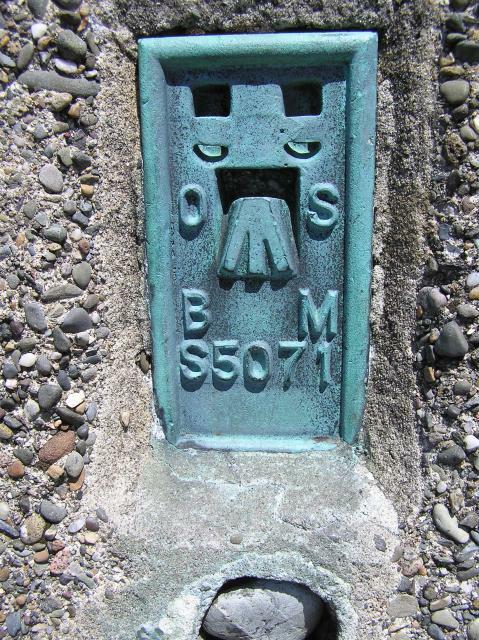 This was back before I had started logging trig pillars so I only took a picture of the topograph. The views out to sea were quite poor, though I could still see all around where I had been walking over the previous few days. I decided to take the easier way back down along the train tracks. It was past 1am by the time that I rolled into Douglas and after dozing for half an hour by the double doors a security guard mercifully let me into the ferry terminal. 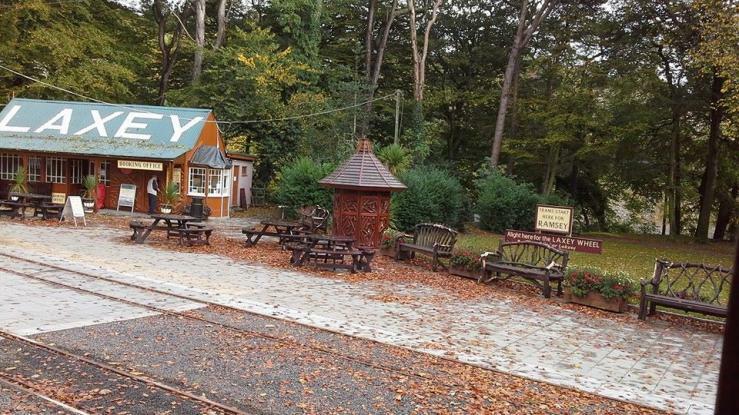 Took the mountain railway from Laxey, not to cheat just for fun, very enjoyable. 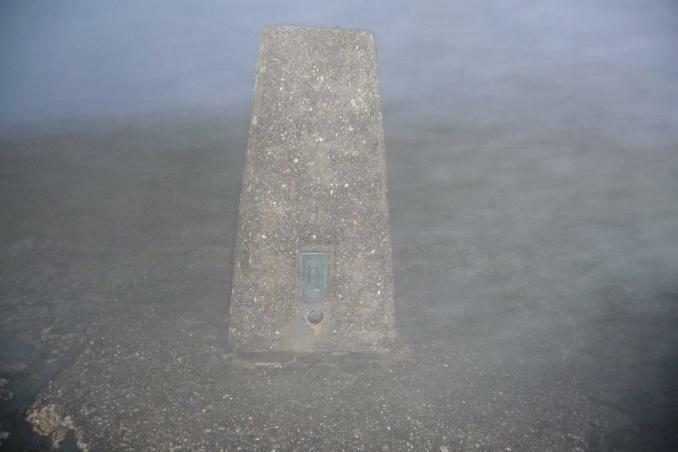 Low cloud and mist at the summit, no views. 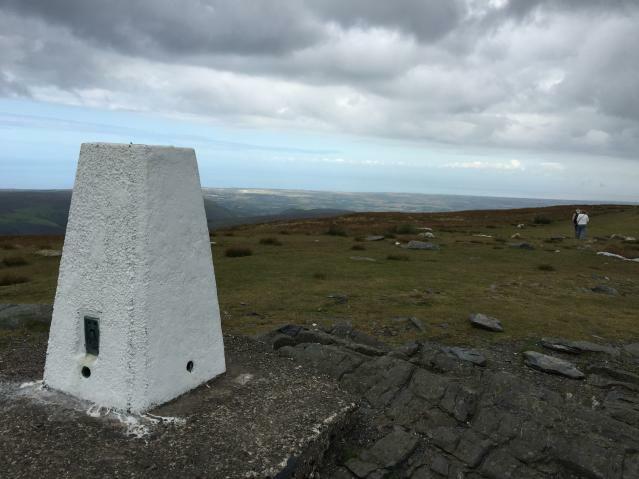 Trig in Good Condition walked up from laxey on a sea to summit walk. Found whilst visiting the Six Kingdoms cache. Great views of the Island sea cloud prevented me seeing much more. visited while caching nearby. Had a trip up on the railway when we thought the mist was clearing. Good views despite the mist swirling. 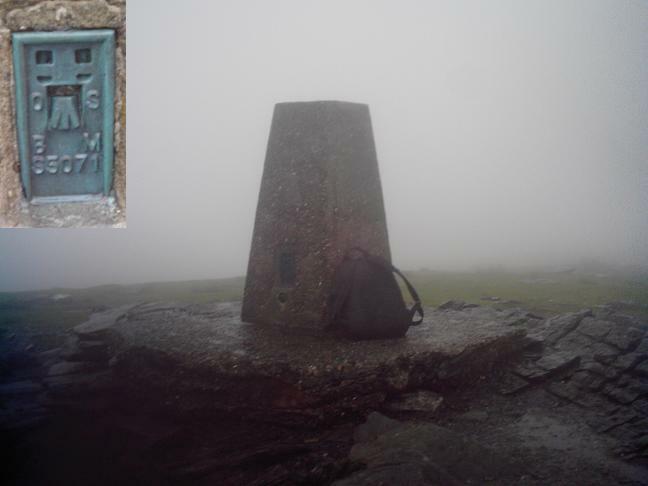 Deceptively pleasant at ground level, driving rain, wind and zero visibility at Summit... ensure waterproofs are handy! 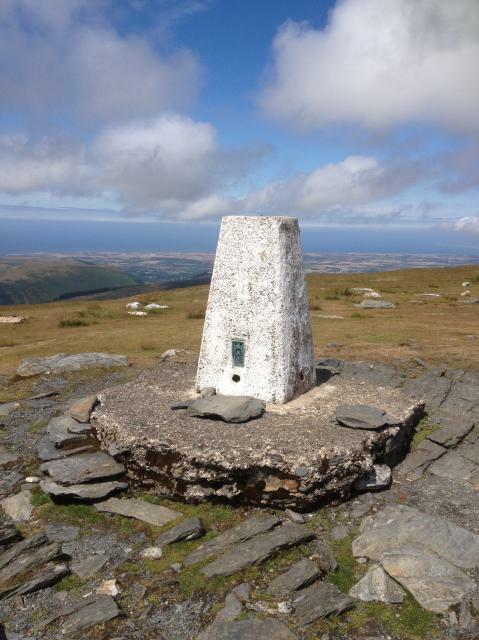 Snaefell ..nice weather for flying fish! 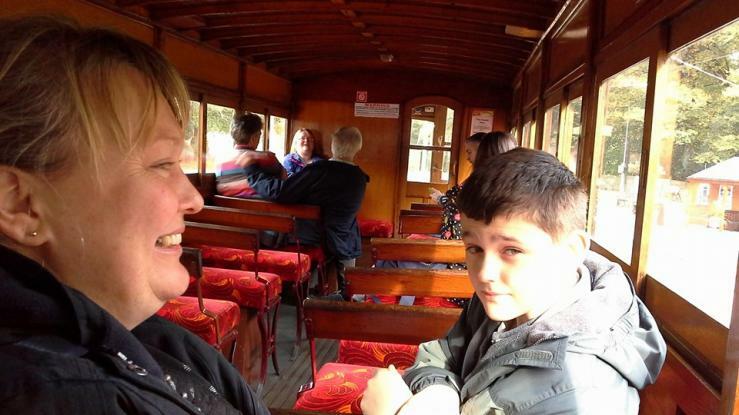 Went for a ride up the Manx Electric Railway. Rather misty so views mixed. Easy to find. Bagged while hunting the Six Kingdoms cache. Why only a 4 Ted? - because all I could see was the nearest building! Terrible conditions but got better as the day wore on. 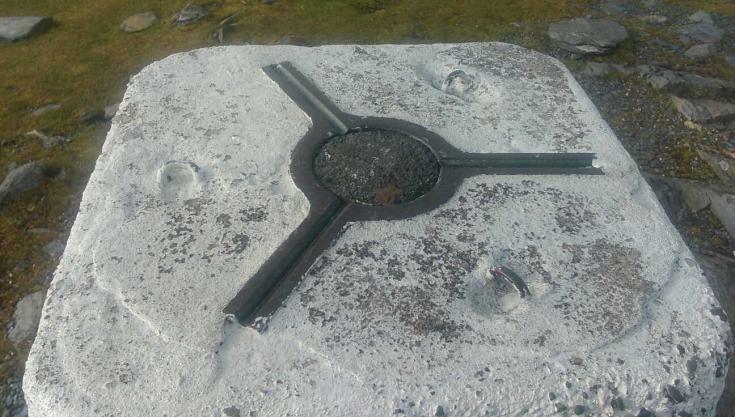 Ice build up on one side of the trig. 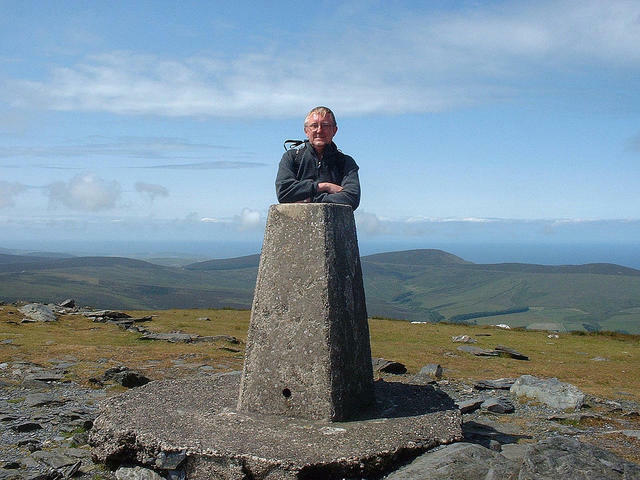 I was staying in King William's School in Castletown so got an early bus to Douglas and was then foxed by the lack of busses to Bungalow, so instead cought a bus to the outskirts of Douglas and hitched from there - from a fellow walker who had walked around the island the previous year. 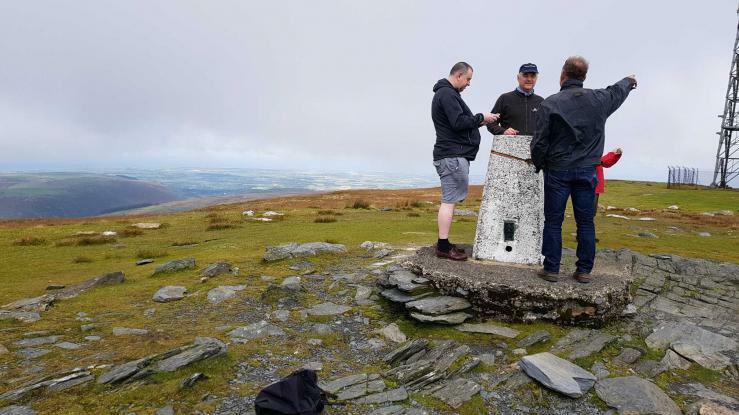 Great views until the rain came! 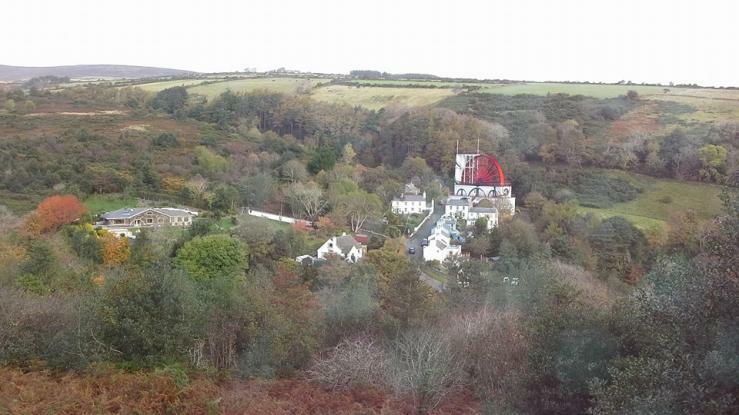 Walked up from Laxey, then realised that still I had the hotel key! Quick tram journey down and up - I don't suppose they sell many returns FROM the summit! 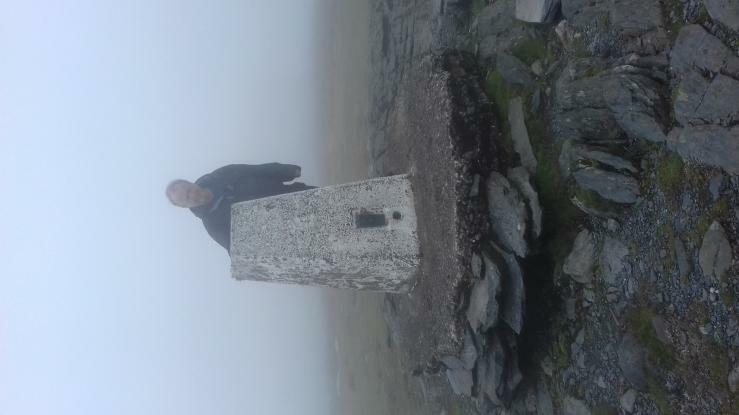 Humid climb to a misty top. Walked up from Bungalow on a warm summer's evening. 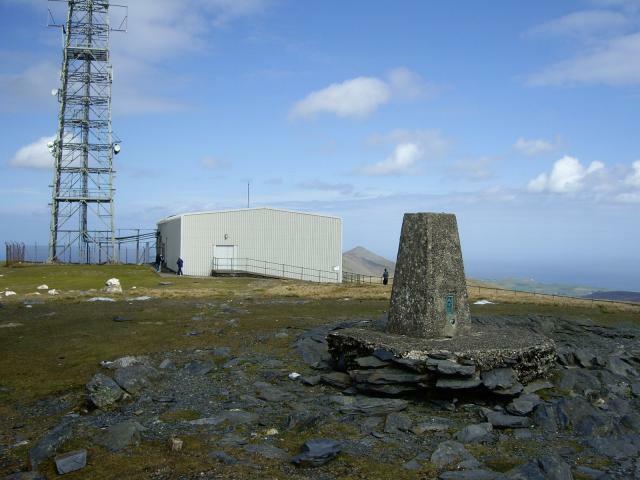 This should be the jewel of the island, but there is a lot of clutter up here, making the summit look a mess. However, the view is the saving grace. Scotland and England visible, Wales and Ireland lost in the mist. 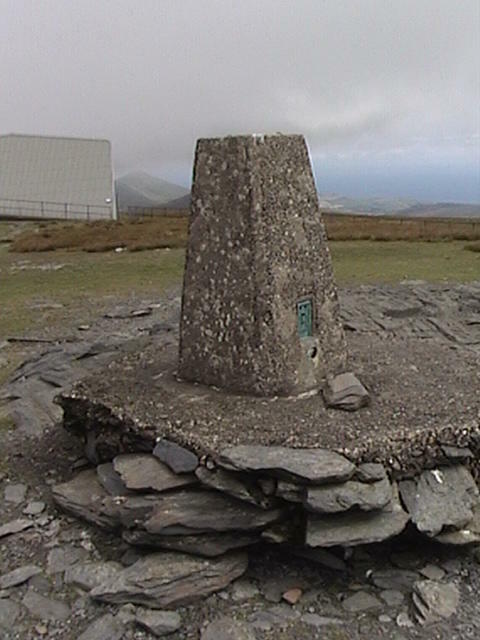 Snaefell - S5071 The pillar. 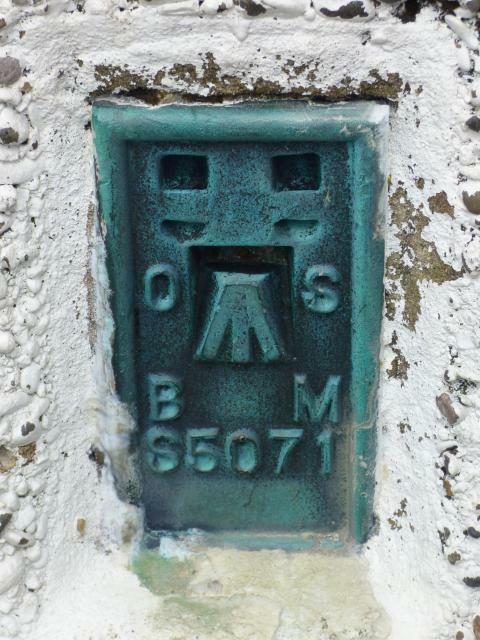 Snaefell - S5071 The flush bracket. Sunny Day. 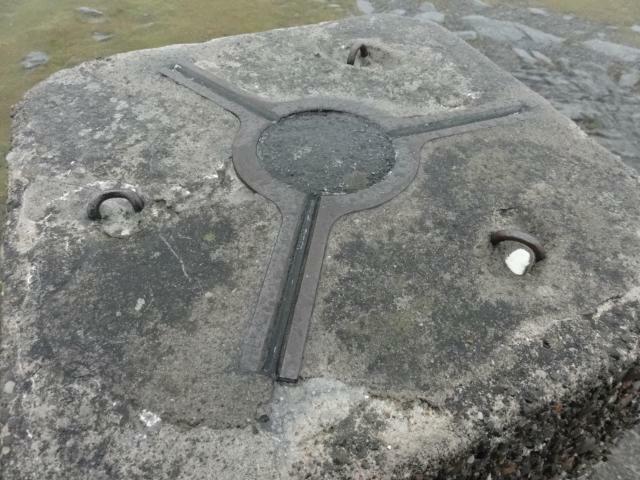 Base of piller, the stand is getting worn away but will last a number of years yet. 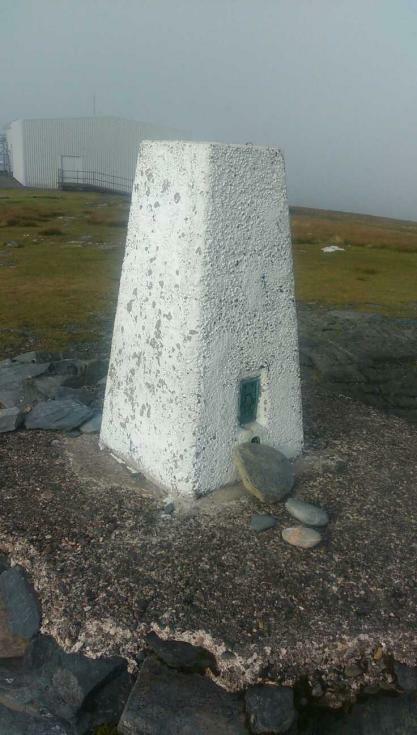 Went up Sanefell to do a cache, Six Kingdoms, also did an IOM Scouts Letterbox near the summit. 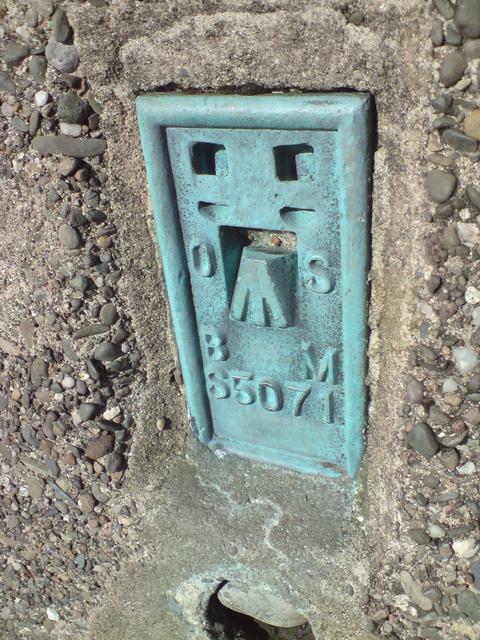 They use the trigpoint as a reference to find the letterbox. Went up by tram. 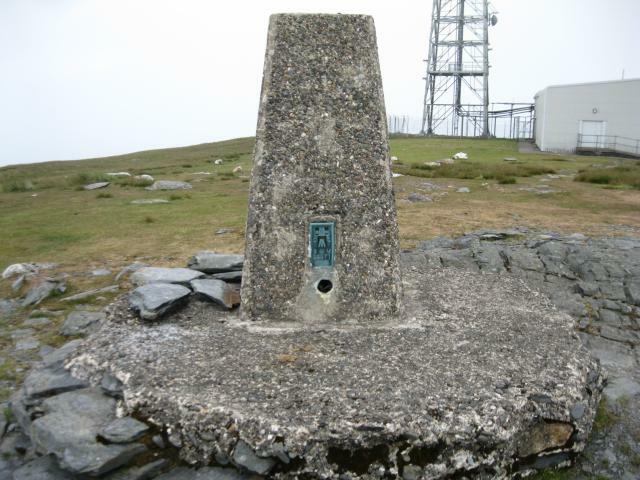 Height of base on which Trig Pillar stands is 2036ft. [Hand held GPSr reading 2039ft.] 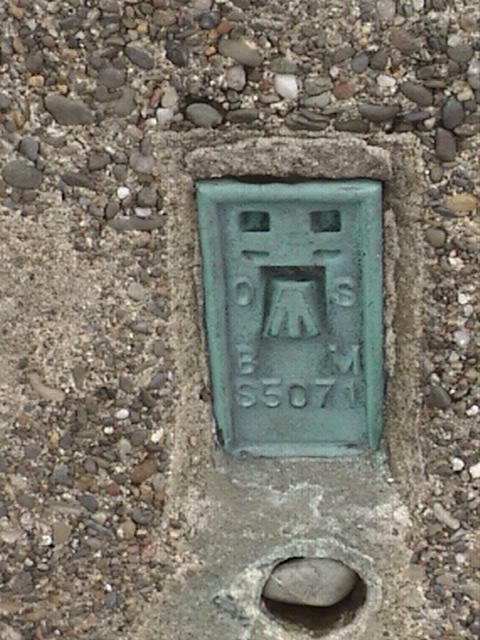 Plug in top of pillar missing filled in with possibly tarmac. 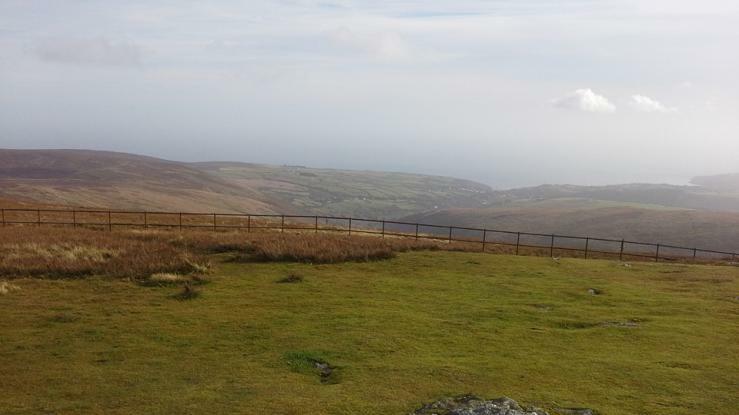 Sunny day, good views of the IOM but other kingdoms were not visible. 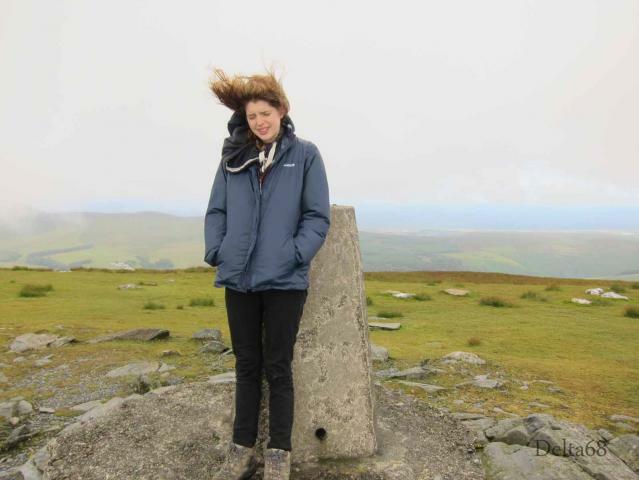 Windy on summit. 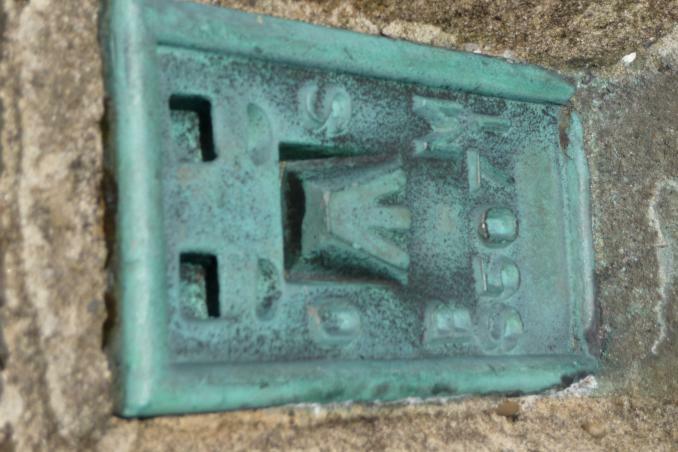 Latest of 5 visits, first in August 1960. 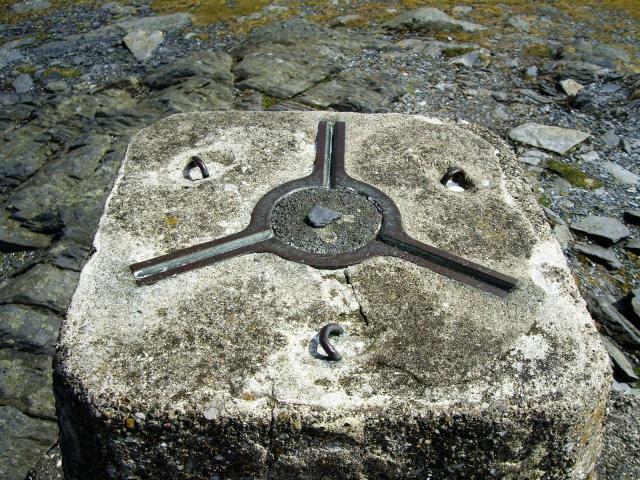 Walked up from Laxey beach in just under 2 hours. Easiest way is from tram terminus ! Much assorted paraphernalia around summit but a most interesting place nonetheless. Fine views over the Island and to the "adjacent islands". 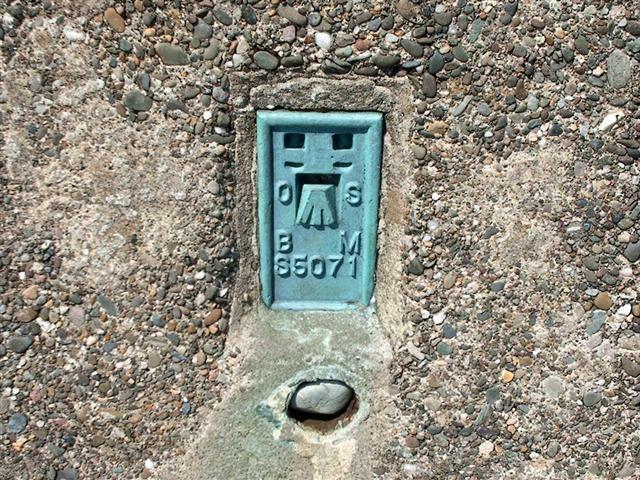 Our last trig on the Island. 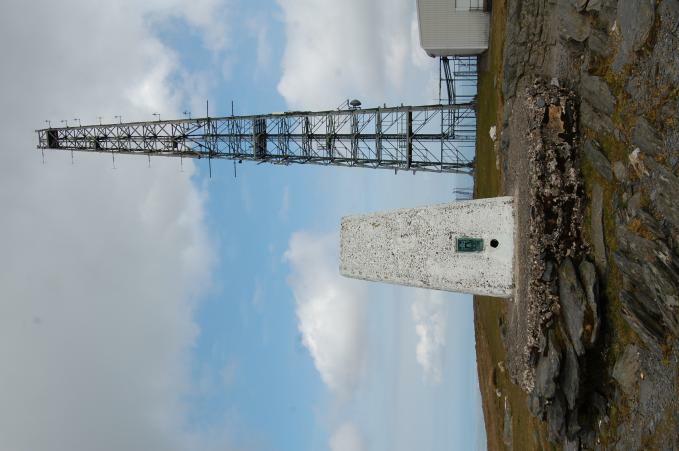 The Isle of Man is an island of contrasts where the trigs are concerned. 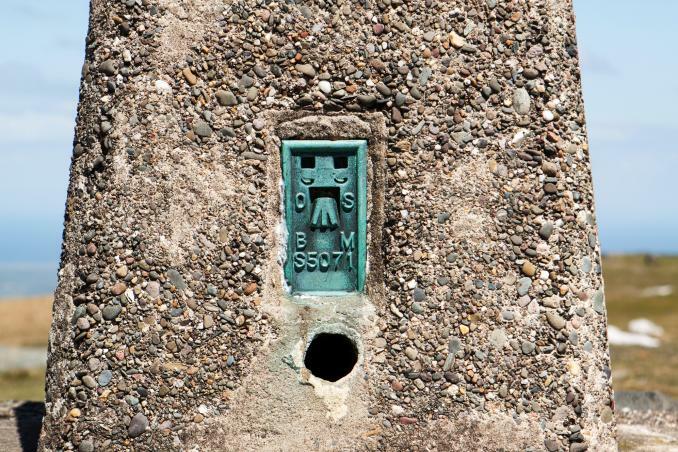 The ones above 400m (6no) are excellent with easy access. 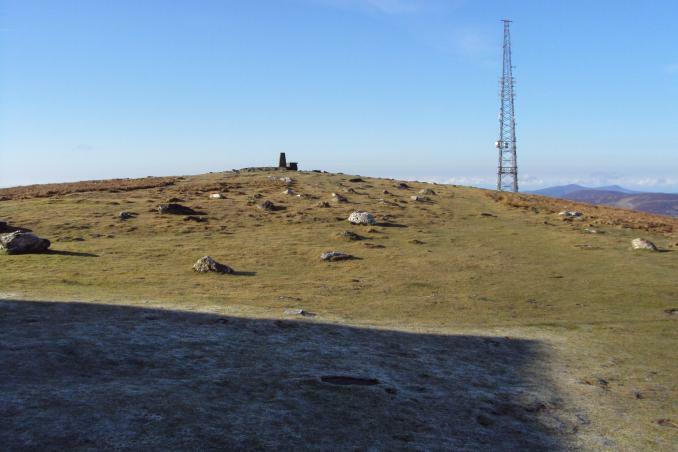 The ones below 200m (9no), with the exception of Corrins Hill and Dreswick Point are more problematic with access, livestock etc as described in our entries. 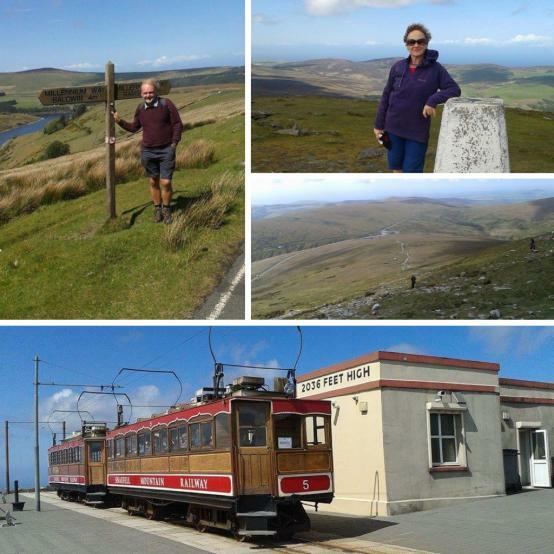 We ascended Snaefell by train (10 pound rover ticket for all IOM transport). 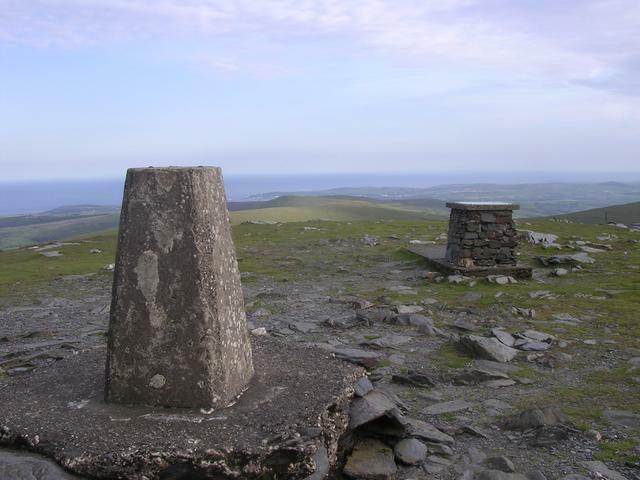 The summit has excellent views and England, Scotland and Ireland were visible (66 miles to Ireland!) according to the nearby viewfinder. 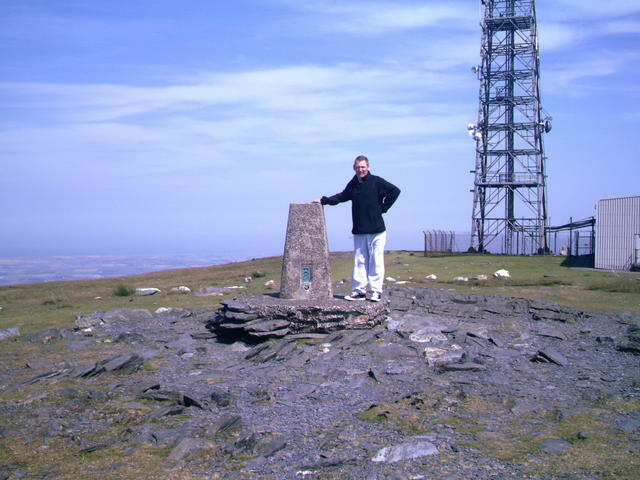 There are also two masts and other hill furniture which detracts slightly. 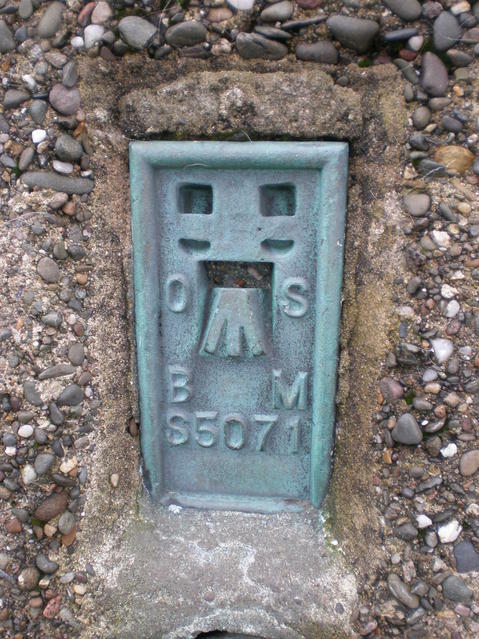 Tarmac plug. Windeeeeeeeeeeeeee as hell. Great view. 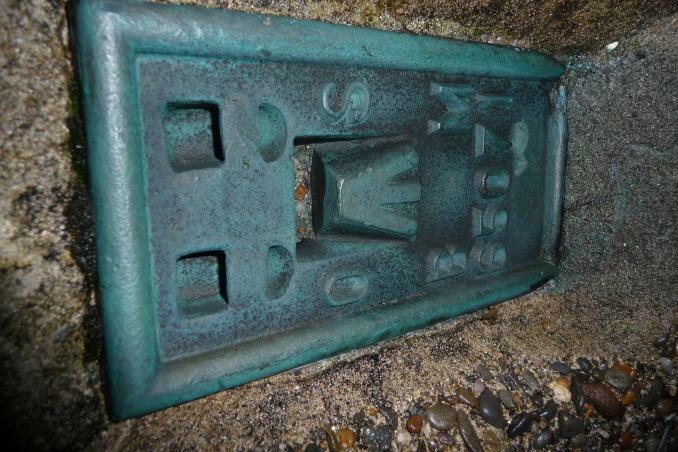 My first and only 'plastic', the railway takes you within spitting distance (well it would have today in this wind). 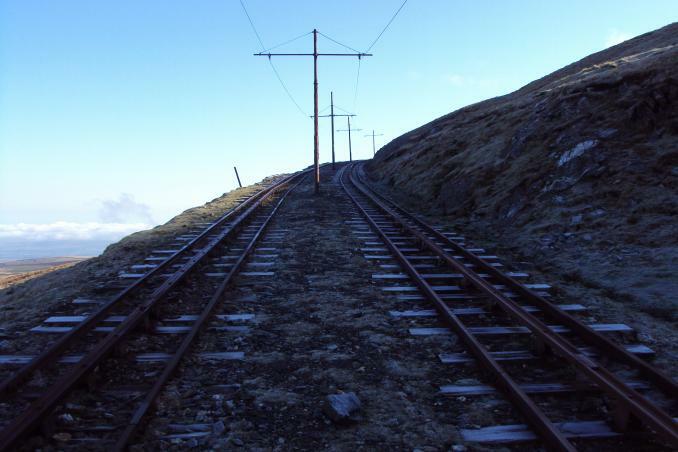 No cars, via the railway. 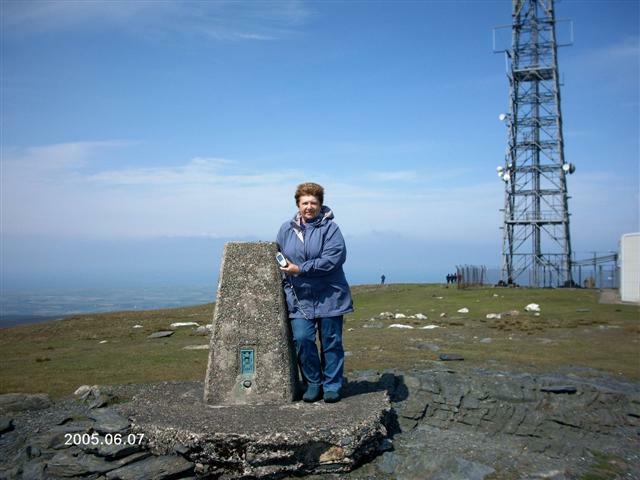 Photo from May 2005 in a less windy climate & on a hike to Laxey via North Barrule (railway to Snaefell then on foot), We were extremely fortunate that the 6 kindoms were visible on this visit. Another 'plastic' visit on 26/09/2006 (after a lenghty coastal walk though). 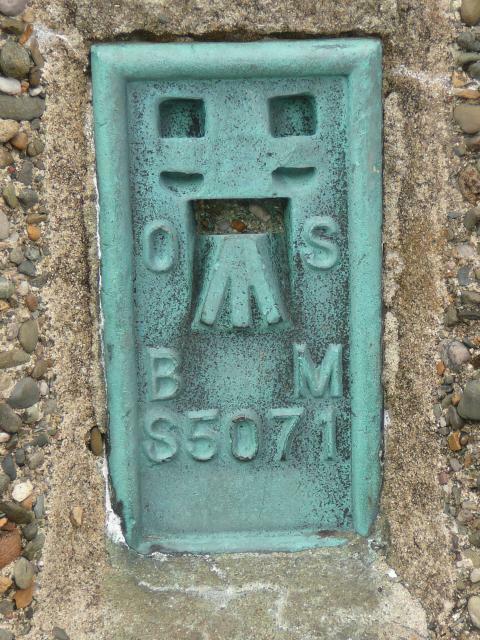 Woman at the trig thought the 3 arms of the spider 'must be because it's to do with the Isle of Man' (I did enlighten her a little!). Walked up from the Bungalow which took about 30 minutes. 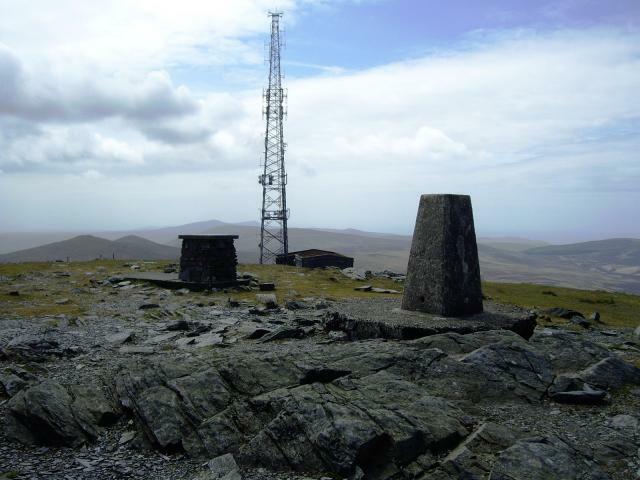 Very very windy at the summit, and rather ugly looking radio masts. 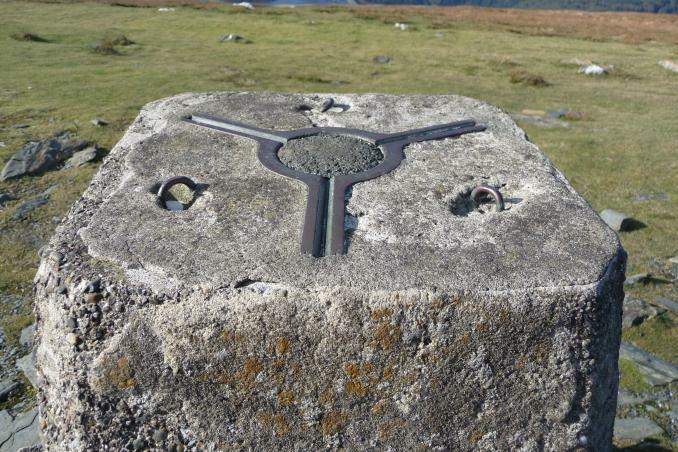 Trig point in good nick though. Splendid clear views all round but just too hazy in the distance to make out the mainland. Took the railway down both out of cultual curiosity and sloth. REVISITED: 04/09/06 Walked up this time from the north side, crossing the railway line where lots of fogies in carriage pointed in awe at the idiot who didn't get the train. I've been up this mountain a few times and for the first time it wasn't misty. Beautiful views in every direction. 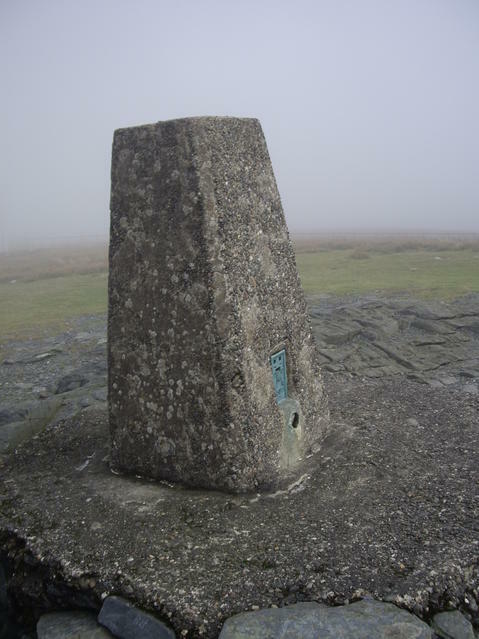 Trad trig. Spider cemented. 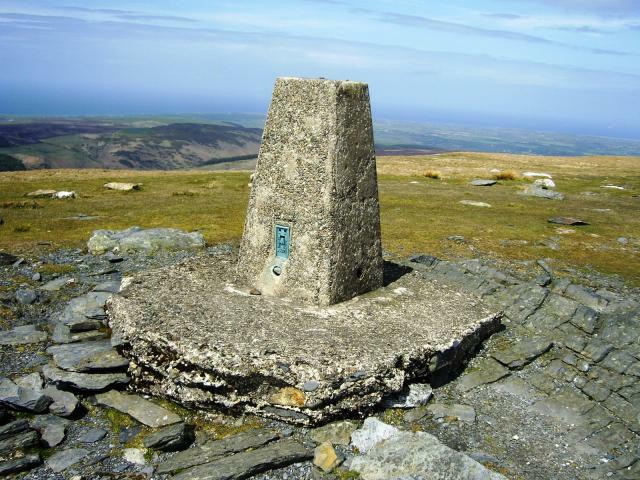 Highest point on IOM. Lot's of bildings and ariels. A Marilyn and Dewey 2000'er. 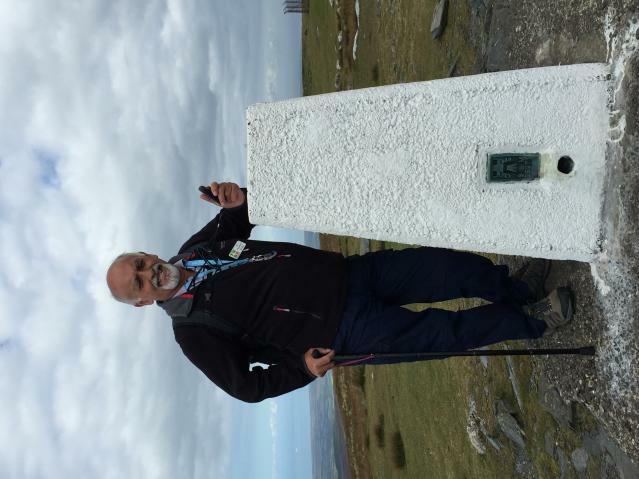 I did this one the hard way on foot, whilst others in the group took the easy route! 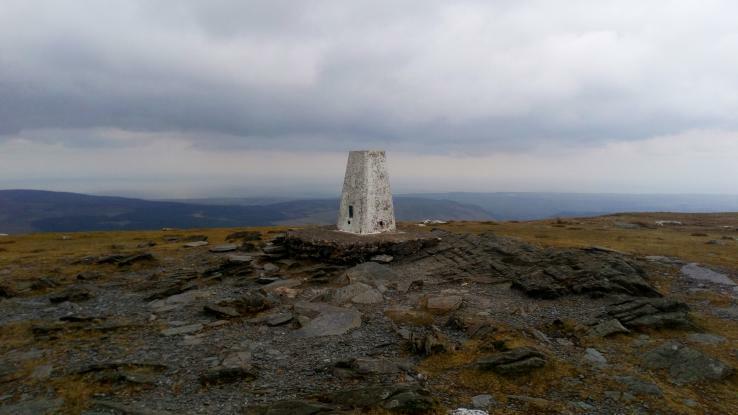 my last 2,000' hill in England and Wales. No view. Mist, but with Patricia Arran and malt! 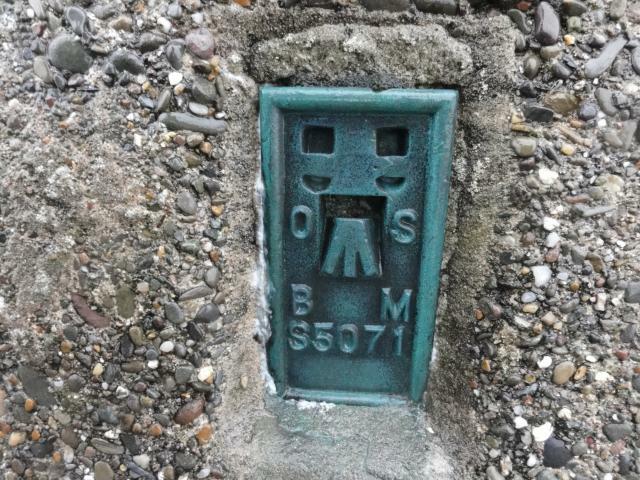 Isle of Man Top. 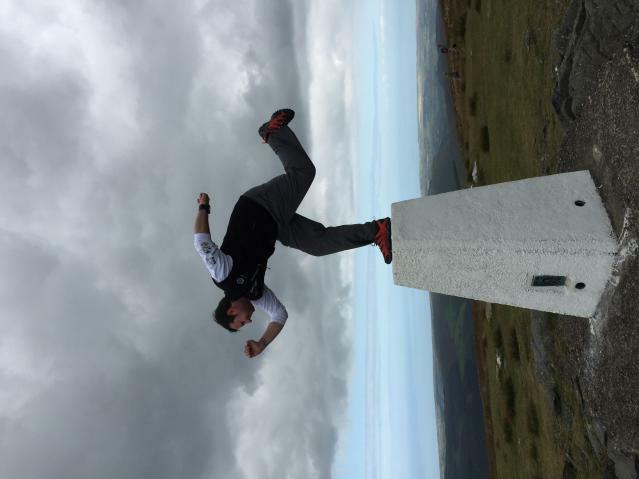 After many times as a competitor, on this occasion I was just a supporter on the Manx Mountain Marathon. Date is approximate. +/- a year. Have to check it.